Glamis Castle is situated beside the village of Glamis, in the broad and fertile valley of Strathmore, only five miles away from Forfar in the county town of Angus, and twelve miles from Dundee, in Scotland. It lies between the Sidlaw Hills to the south and the Grampian Mountains to the north, approximately 20 kilometres inland from the North Sea. The estate surrounding the castle covers more than 57 square kilometres (14,000 acres), and there are two streams running through it. It is the current home and residence of the Earl and Countess of Strathmore and Kinghorne, and is open for public viewings. 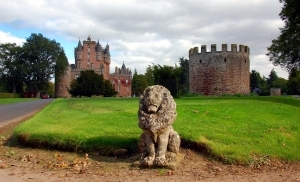 Glamis Castle, set in the picturesque Angus countryside, makes a stunning entertaining venue and is today used for private receptions, lunch parties, grand dinners, cocktail parties, fashion shows, musical evenings, wedding receptions, and filming, amongst others. The Park is also suitable for many outdoor events such as craft fairs, rallies, equestrian events and shows. 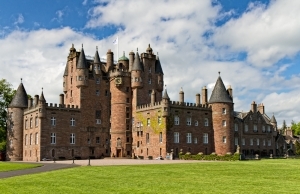 It is very easy to get to Glamis, as Dundee Train Station is situated only 12 miles away. Bus service is also available both from the Seagate Bus Station in Dundee, as well as from Forfar. 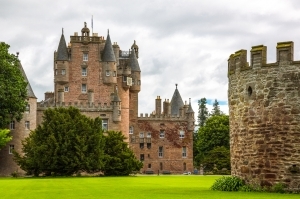 As soon as you enter the Queen Mother Gates at Glamis Castle and see its turrets and towers nestled at the end of the mile-long drive, you will be immediately impressed by its majesty. Architecturally, the towers in front of the castle each measure 7 meters, that is, 23 feet in diameter, and are about 4 metres, that is 13 feet, high, with a modern parapet. The walls are 1 meter, that is 3 feet and 3 inches, thick. The clock tower houses the castle’s archives, which include a wide range of historical material relating to the castle itself, as well as the Bowes and Lyon families. Moreover, when visiting the Castle, one can admire the Queen Mother’s childhood room, as well as Princess Margaret’s room, and the room where King Malcolm of Scotland died. During the 17th century, several additions were made to the castle. A small north-east wing was added, which would in future house the chapel. The walls surrounding the castle and the surrounding buildings were all removed, and were replaced by baroque sculptures and a courtyard. In the mid-1700s the grounds that lay in front of the castle were landscaped and the line of trees one sees today leading up to the castle was planted. In 1775, the castle grounds were redeveloped into open parklands. The last major alterations to the castle were the addition of the Dutch Garden at the front of the castle in 1893, and the addition of the Italian Garden in 1910. The gardens surrounding Glamis Castle are enriched with different walks, which were created to take in a mixture of habitats ranging from park land to the formal Italian Garden, mixed woodland and a Pinetum to the North East. Here one can enjoy the peace and tranquillity of Glamis, while walking though the Yew Hedges, Douglas Firs, hardwood trees, and the Nature Trail, which is some three-quarters of a mile in length. Here one can also admire various different examples of flora and fauna. Sightings of red squirrels, herons, and roe deer are quite common. Visitors can leave their car in the parking area next to the Castle. When touring the Castle, one must make sure to see the beautiful dining room which sports sumptuous wood panelling and which was installed in 1850, descend into the barrel vaulted crypt, climb the main spiral staircase, which has 143 steps in total, and also view the huge drawing room, which once served as the great hall of the medieval castle and is the highlight of the tour. After this, one cannot but walk towards the small private chapel, as well as the royal apartments, which reflect a more modern change in decor and style. Glamis Castle is known as one of the most haunted castles within the British Isles. There have been numerous sightings of ghosts on the property over the last century, with up to twenty different spirits being reported. According to legend, the Castle was doomed to be inhabited by so many tortured spirits because of an ancient curse brought on the family by the first Sir John Lyon, who removed an ancestral chalice from their seat at Forteviot, where it was supposed to reside forever. The most famous of the ghosts belongs to Janet Douglas, who was burned at the state for being a supposed witch in 1537, after having being cleared of the crime of poisoning her husband, and marrying her second husband, Archibald Campbell of Skipness. Although her second husband escaped the various allegations against him, she did not. King James V tortured her, her family and servants, and later burned her. Known as the Grey Lady, she is said to haunt the chapel within the castle, being seen always sitting on the same chair at the back. Another reported ghost belongs to a black slave boy who in the 17th century, was supposed to have been stripped naked and hunted savagely as ‘sport’ by the current Earl, his friends and hunting dogs. The slave was impaled with lances and torn apart by dogs while the nobility looked upon the spectacle laughing. This murdered slave’s ghost, known as ‘Jack the Runner’, has been seen darting and running around the castle while screaming in agony. Many legends and ghost stories also surround the supposedly ‘secret chamber’ hidden within the castle, and which is supposed to hold a terrible secret. There are different stories regarding this room and what it contains. One version of the legend states that the room holds the remains of the Monster of Glamis, a hideously deformed child who was born to the family and locked in a suite of rooms never to be seen by outsiders. The chambers were then bricked over forever when the child died. An alternate version of the legend says that a vampire child is born in every generation of the family, and is walled up in that room. Another, most commonly related tale recounts how during the 15th century, Alexander Lyon, 2nd Earl of Glamis, was sitting up late getting drunk and playing cards with a friend. At midnight, his friend refused to play anymore because it was the Sabbath. The Earl was very angry and commanded the servants to play cards with him instead. They too refused. In anger, he shouted that he did not care about the Sabbath and would play at cards with the Devil himself if he should consent to come. Suddenly, a stranger appeared who offered to play cards with him. It was the Devil, who took the Earl’s soul and condemned him to play cards alone forever until doomsday. He was subsequently sealed inside that room forever. There are also rumours of Scottish clansmen who might have sought refuge from their enemies at the Castle. Betrayed, they were led to the secret room, where the door and windows were bricked up and they were left alone to starve to death, thereby leaving their bones and spirits to haunt the chamber till this day. It is said that only the older son of the family is told what the secret is when he comes of age. No one knows the truth of the story about the secret chamber, the fact remains that if you stand outside the castle and count the number of windows, and compare them with the number of windows inside the building, you will always be two windows short, which would point to the idea that there really is a secret bricked up room somewhere on that floor.